A Nuclear Nonproliferation Treaty (NPT) went into effect in 1970. This treaty was designed by existing nuclear power states (the United States, the Soviet Union, England, France, and China) to prevent the spread of nuclear weapons to other countries. While about 190 states adhere to this treaty, the threat of a nuclear war obliterating human life still exists. A few non-adhering states—Israel, India, Pakistan, Iran, and North Korea—have developed nuclear arsenals, and the NPT did not stop the five existing nuclear states from increasing their arsenals. The NPT did not stop the United States and the Soviet Union from expanding their arms race. By 1967 the Soviet Union had begun to create an Anti-Ballistic Missile (ABM) shield around Moscow to defend itself against a nuclear attack. This early defense system was not foolproof, but it caused U.S. President Lyndon Johnson to worry that the Russians would be able to launch a first strike attack against the United States and defend themselves from retaliation with their missile shield. As a result, Johnson initiated SALT (Strategic Arms Limitation Treaty) talks and the U.S. began developing its own ABM system. This was an attempt to agree on nuclear parity and a bipolar world order to create some international stability. By 1977 the Soviets overtook the United States, which peaked at about 30,000 warheads in 1967 under President Johnson, and the Russian stockpile peaked at about 40,000 in 1988. Ronald Reagan saw anti-ballistic missiles as the means to create an end to nuclear weapons. If a state could defend itself from a nuclear attack with ABMs, then it would not need nuclear weapons as a means of defense but could destroy its nuclear weapons and still defend itself. Reagan thus changed the SALT talks, which limited production, to START (Strategic Arms Reduction Treaty) which reduced the number of nuclear weapons. Reagan’s target was the complete elimination of nuclear weapons. Following this line of thought, President Reagan initiated the Strategic Defense Initiative (SDI), which would make the need for the United States to create more nuclear weapons obsolete—unless they were to be used for aggression. He offered to cooperate with Soviet President Gorbachev in defensively arming both blocs with missile defense systems that would create an environment for the complete elimination of nuclear weapons. This caused the Russians, who were nearing economic collapse, to react by calling SDI “Star Wars,” saying, like President Johnson had said about the Russians earlier, that the U.S. would be capable of launching a first strike and defending itself. Trust was hard to generate as both systems had aggressive and peaceful forces pressing from within. However, sanity began to replace MAD as the START talks served to build trust and eventually proved quite successful. By 2010, both the Russians and the Americans had destroyed over 75 percent of their nuclear warhead stockpiles and were close to parity at about 7,000 nuclear weapons each. However, neither country, nor the other countries that have acquired nuclear weapons, has appeared willing to completely eliminate their arsenal. Rather, some states that are not signatories to the NPT, particularly Iran and North Korea, have tried to ramp up their own nuclear weapons programs, causing renewed fears of nuclear war. 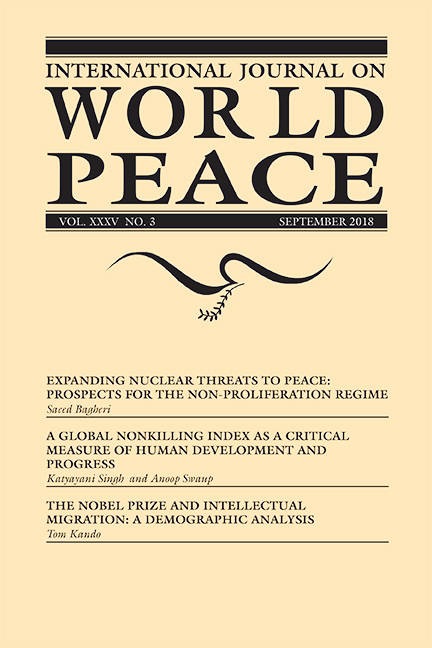 Our first article, “Expanding Nuclear Threats to Peace: Prospects for the Non-Proliferation Regime,” by Saeed Bagheri explains the changing dynamics of the NPT and its long-term viability now that the treaty is nearly 50 years old and the world has undergone dramatic changes geopolitically and technologically. Some of the smaller states tend to view the NPT system as a holdover from colonialism, where world powers dominated smaller powers. And, when the original nuclear powers, or nuclear powers not signatory to the NPT have such weapons, the security of smaller states remains suboptimal. We also learn from Bagheri about problems with the nuclear inspection program and the essential moral conflict between the traditional laws of war and peace and the NPT regime. It is time to push past the instinctual impulses for power and dominance in aggressive weapons of mass destruction and create military regimes that are capable of national defense, while limiting the fear of aggression they instill in others. The basic premise of Hugo Grotius’ The Law of War and Peace, which undergirds the international state system is the respect for sovereignty of states. This implies that no state has the right to invade another, and that an invaded state only has a right to drive back the enemy and respond with proportional force. Application of the principle of the right to self-defense but no right of aggression to nuclear weapons would mean the right to defend onself with Anti-Ballistic Missiles (ABMs) but not a legal right to explode a nuclear weapon, whose only purpose is aggression or threat of aggression. Hence, a state that possesses the means to defend itself against a nuclear warhead, without possessing warheads itself can be considered as representing a higher moral, or more respectable position than a state that possess nuclear weapons. Complaints by suspicious enemies that defensive missiles provide a state with a first strike option will disappear if a state can dispose of its nuclear arsenal and still successfully defend itself from attack. Such a state will signal a less aggressive or expansionist desire that will violate the sovereignty of other states. The existence of Russia’s ABMs made the START treaty a possibility. Advances in precision and accuracy in modern technology should make such defensive systems more reliable and thus the need for nuclear weapons for non-defensive purposes obsolete. In this situation, the possession of nuclear weapons by any state, including the original five powers, is a signal to the world community that the state has evil intentions and is untrustworthy. Abandonment of nuclear warheads, while maintaining the ability of a state to defend itself, is a reflection of a state with higher social consciousness that possesses genuine leadership. Our next article, by Katyayani Singh and Anoop Swarup, proposes a “Global Nonkilling Index.” This index reflects an advanced method of indexing peace by looking at “killing” beyond traditional murder rates, to includes suicide, capital punishment, and battlefield death rates. The capital punishment rate is a symbol of either an excessively harsh and inhumane regime or a social system that produces excessive criminal behavior. The suicide, or self-killing rate, correlates with the frustration and despair of a society. Battlefield deaths for defense of a state are justifiable, but are also the consequence of regimes that send young men to die for less noble purposes. Combining statistics on all these forms of killing into a global nonkilling index provides a more accurate overall picture of which states are the most peaceful and happy. The authors provide for us a 2015 Nonkilling Index because the World Health Organization only collects data for suicide rates every five years. 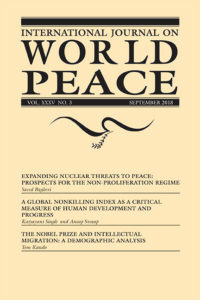 Because a nonkilling index provides a better correlation to peace in a broader context than simple murder rates, the adoption of a nonkilling index, such as proposed in this article, will hopefully encourage the collection of more data on killing in any form every year by the World Health Organization and others. Our final article, by Tom Kando is a demographic analysis of Nobel Laureates that contains a specific focus on the “brain drain” from Germany and the Austro-Hungarian Empire to America, which was quite dramatic and possibly accounts for the U.S. victory in World War II and the “space race.” Kando concludes that the openness of U.S. immigration policies combined with the suppression of minority groups and freedom of thought under Nazism, Fascism, and Communism was responsible for this demographic shift. His article is an appeal to open immigration policies and a rejection of the nativism that seeks to close borders. Kando’s article also shows that awarding of Nobel Prizes to women and people in other parts of the world has been gradually increasing, probably both reflecting a greater effort on the part of the Nobel Committee to be more global in outreach, and changing social conditions. The Nobel Prizes for Peace, which are awarded by a different committee than the prizes for science, economics, and literature, tend to be more globally diverse, perhaps because the awardees tend to be people who stand up for social justice or democracy and against oppressive or corrupt political regimes. Such awards reflect the desire to live a decent life, to which people everywhere aspire. On the other hand, not everyone has the same aspiration to excel in science, literature, or economics. The question that naturally follows is: “Why did so many scientific discoveries and cultural advances come out of European culture from the time the Nobel prize was founded until the 1930s?” Was it because of a focus on educational practices like teaching piano to young children that stimulate the development of both sides of the brain and their integration? Were strict disciplinary practices in schools responsible? Were there social incentives and rewards for scientific achievement? Were there cultural beliefs or other traditions that stimulated scientific advances? Do the factors that caused the rise of scientific advancement exist in the United States, or is it merely the repository of refugees from Europe that provided one generation of scientific leadership from people raised in Europe? Can the social factors that enabled people from Europe to win Nobel Prizes be better adopted in other countries? Such questions would be good grist for future sociological research stimulated by the demographic analysis of Nobel Prize winners produced by Kando.